In our parish we believe that we all face a choice between Two Ways to Live -- Our way or God's new way. 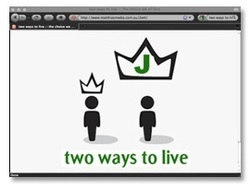 This link will take you to the Two Ways to Live presentation which explains the message of Jesus in a down to earth way. get in touch with us - we'd love to speak more with you.